Buies Creek – Campbell concluded its 2016 training camp Thursday with its annual Fan Fest and final preseason scrimmage. 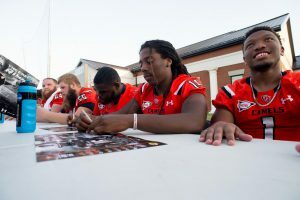 The event featured an hour long scrimmage, followed by autographs and photos with the team and coaching staff at Barker-Lane Stadium. The Camels reported to camp on August 3. Campbell kicks off the 2016 season Thursday night, September 1, hosting Bluefield College at Barker-Lane Stadium. Kickoff is set for 7 p.m.
Campbell returns seven offensive and five defensive starters, as well as 32 total letter winners from 2015. The Camels ranked fifth in the nation in total defense in 2015 (279.3 per game), standing third in team sacks per game (3.55) and ninth in scoring defense (17.7). The team shattered program records for all three categories, adding single season marks for tackles for loss (85.0) and total sacks (38.0). Running back De’Shawn Jones, the PFL’s leading rusher in 2015, as well as offensive linemen Brian Stryffeler and Laurin O’Briant were named to the 2016 Preseason All-PFL team last week. Redshirt sophomore linebacker Jack Ryan also returns after being named the PFL’s Freshman Defensive Player of the Year in 2015.